Beloved by bears, these shrubs are ubiquitous in the surroundings of the Wrangell Mountains Center, especially in sunny, open areas. Leaves with coppery brown scales on their undersides form in opposite pairs, and small yellow flowers bloom in May. The shrubs are dioecious, meaning male and female flowers grow on separate plants. Bears feast on the berries, which are also edible for humans. They are traditionally whipped with sugar for a dessert. The fruits contain saponine, the compound responsible for the froth referenced by the common name. As always, only consume wild plants when identified with absolute confidence. Similar to yellow dryas, the first plant we featured this season, white dryas also blooms in the area surrounding McCarthy. These flowers are a less common sight to catch during their bloom in June as their range is restricted to higher alpine slopes. We caught sight of them during our WMC staff hike to Jumbo Mine earlier this season. The flowers are larger than their yellow cousin and have a distinct set of eight white petals. The leaves have a wavy (dentate) margin that distinguish them from another related species, Dryas integrifolia. The evergreen plant forms a matted groundcover that helps it hold its own in these exposed habitats. Explore the land around the Root Glacier, and you will notice that alder is one of the few tree species that grows near the glacier. Its serrate leaves are a shiny green and similar in appearance to those of birch, another member of the Betulaceae family. It forms separate male and female flower clusters (catkins) in May through June. Its fruits appear cone-like when mature. Alder is capable of fixing nitrogen, which allows it to grow in nutrient-poor soils, such as those recently exposed by retreating glaciers. It is thus one of the first early-successional species to move in after glacial retreat, and its contribution to the soil makes it possible for other species to colonize the area. Alder buds, twigs, and nutlets are important food sources for many bird species. We are daily pulling this weedy wildflower from our vegetable gardens. Perhaps we tend to overlook its beauty and practical value. 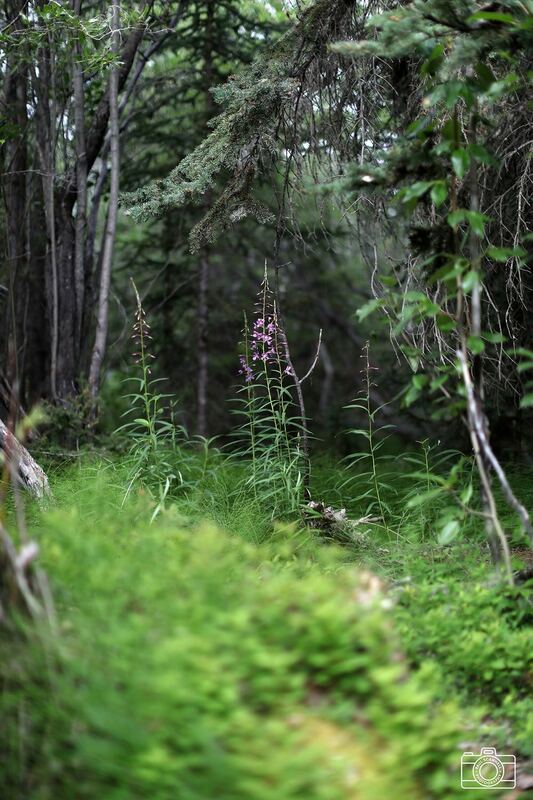 It blooms in meadows and along roadsides throughout Alaska in July through August. This perennial has elegant feathery leaves and tiny white flowers that develop in a corymb similar in appearance to wild carrot. The leaves and flowers are traditionally prepared to treat colds and fevers, and all aboveground plant parts can be harvested to produce a yellow dye. It is the time of year when the brilliant pink flowers of fireweed adorn the wildflower beds of the Wrangell Mountains Center and the roadsides of McCarthy. The flowers are easily recognizable on their tall stalks (racemes) in early to mid-summer. The plant’s deep root system allows it to regenerate rapidly after fire, giving it its common name. Both flowers and leaves are edible and make lovely decorations for baked goods. The new spring shoots are especially tender. As always, only consume wild plants when identified with absolute confidence.